Our Your Happy Nanny for the month of February is Kathleen (Katy) Burke. Katy recently moved to Atlanta from North Carolina and is seeking a full-time nanny position to begin as soon as the right family is found. 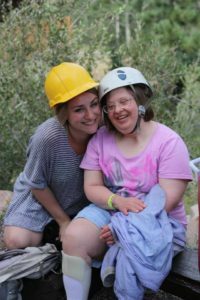 Katy has worked as a full-time live in nanny and has extensive experience working with both children and adults who have special needs. Her most recent nanny position involved working with a child who has autism, and she wrote a children's book about her experience. Katy is bright, happy, and ready for a new family to work with! Check out Katy below, and let us know if you'd like to schedule an interview with her. I just got an apartment in walking distance from downtown Decatur. I was born in Denver, Colorado and lived there until I went to Emerson College in Boston. I took a few years of French in high school and wish I could have taken more! Sometimes I play French games on my phone to practice. I’ve been a babysitter and mother’s helper since I was ten years old. At one point, my sister and I were the primary babysitters for at least eight different families in the neighborhood! I began working as a live in nanny three and a half years ago. I love people of all ages but babies and toddlers have a special place in my heart. I feel really lucky when I can watch those years of development first hand. I feel that nannying, that being a part of helping a child learn, grow and think is a very important job and I feel proud to go to work. But as much as I can give kids, they always have so much to give back to me too. Whether it be a reminder that there is nothing in the world that could beat a chocolate chip cookie or how amazing it is that the sky is blue every single day, working with kids helps me stay grounded and thankful for ordinary miracles. I have been babysitting for about twelve years and in that time I have worked for many different families, each with their own unique lifestyles. I have come to appreciate a variety of parenting styles habits, and traditions. I think this makes me flexible in new jobs. I can easily adapt my work to fit the needs of different parents and children. I recently visited the Atlanta Aquarium for the first time and WOW- what a fun and beautiful place! I also love walks around the neighborhood and taking kids to playgrounds and libraries. My parents took me camping in the Rocky Mountains all the time, and I treasure my memories out in the sunshine. I love when I can go out to play with kids so they can run free, breathefresh air and to explore the natural world around them. I am a passionate crafter. Anywhere with paints, glue, glitter or ribbon is where I want to be. I also love to bake, and on rainy days there’s nothing better than warming up the house with fresh bread or muffins. I attended an arts middle and high school from 2006 to 2012 where I majored in theater. I then attended Emerson College in Boston, MA. for Theater Education. My major taught me how to teach children a variety of different subjects while getting kids out of their seats and emotionally involved in the material. I feel lucky that I’ve had such a strong presence of arts in my life because school did not always come easy to me and finding creative ways to learn the material was essential to my learning process. I love that now I have the tools to help kids achieve the same success. In my free time I love to craft- most recently I’ve been working on flower garlands to decorate my new apartment. I also love exploring the city and trying new restaurants. I have friends who are starting a production company here in Atlanta- so helping with their projects (by acting, cooking, running errands, etc) has been an awesome way to meet people andhave fun since I’ve been here. I am patient and creative when dealing with difficult situations. What's something that a family might be interested to know about you? Last Spring I self published a children’s book titled Z is for Zip. It is a learning tool for children who have questions about their peers and siblings with autism. The illustrator and I met while volunteering at Rocky Mountain Village (an Easter Seals camp for people with disabilities in Colorado). We both volunteered several years in a row and fell in love with the campers - and in awe of all they had to teach us. The book is meant to show children that different does not mean wrong, and to treasure the wisdom of people who think differently. I’m ready and excited to start work now! We are now members of the INA!